This article originally appeared on The Well, Jopwell’s digital magazine. Earlier this fall, I ran into one of my most promising students near the quad on campus. “Matt*, how’s life? How are classes?â€ I asked. “Timeout. Are you saying you aren’t smart?â€ I replied. We proceeded to have a 10-minute conversation about life, working hard, and having a positive attitude. Then we shook hands and went our separate ways. That was the last time I saw Matt. He died in a car crash three days later. So now that I’ve “made it,â€ I must be my brothers’ and sisters’ keeper. 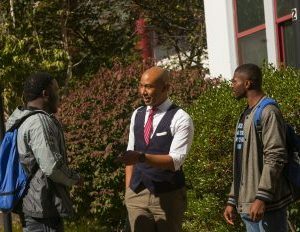 I must go from meetings about curriculum revisions with deans and vice presidents to convincing a young man that the dividends of a college degree are much greater than selling drugs on the street. I share my students’ stories (always maintaining their anonymity) with my colleagues so that those who might be sincerely ignorant of their students’ realities do not dismiss them as being lazy, unmotivated, or unintelligent. This information is often met with astonishment, both that a student would divulge something so personal to me and at the realities and choices students of color face. Their reactions remind me that there is an experience gap in higher education and it has nothing to do with seniority. To bridge it, PWIs need more faculty and staff of color. As one of the few, my greatest hope is that I can serve as a role model and flood my students’ minds and spirits with the encouragement they need to go forward. My greatest fear is that too many voices will discourage and make excuses for them and that they will never recognize their true potential. We can’t let that happen. The Well is the digital magazine of Jopwell, the career advancement platform for Black, Latino/Hispanic, and Native American students and professionals to unlock opportunity. Subscribe to receive weekly stories and advice in your inbox.